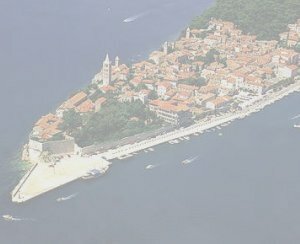 Accommodation In Malvina Apartments On Rab Island - Welcome! Looking for a place for a complete rest in an untouched nature? Would you like to take a bath and refresh yourself in a limpid blue sea? Would you like to replace the everyday fuss, smog and uproar with a sojourn in the nature and long walks by the sea? Choose the greenest island in the Adriatic. Come and have a rest at our place! 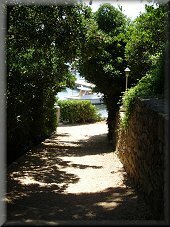 It is our pleasure to invite you to come to our house on the island of Rab. We offer you accommodation in two spacious two-room apartments of 1st category. 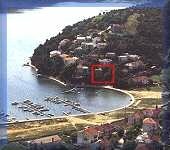 Our house is placed in a place called Palit, 7 m above the sea, on a quiet spot in the beautiful cove of St. Eufemia, 1.5 km from the old town of Rab, only 20 m away from the sea. The house is circled by a pine woods and other Mediterranean herbs. The view from its balconies extends to a flowered garden, the woods and the sea. 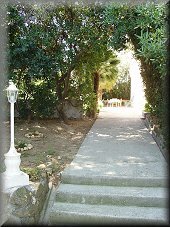 A special atmosphere is created for moments spent in the front garden of the apartment shaded by pines and palm-trees. Besides the house, we also own a parking space protected by natural shade. The place to moor the boats is only 40 m away. The island of Rab, our house included, is well covered by GSM mobile telephone network. You will spend your holidays in our house, in a quiet place, near the sea and in the same time the town center still remains near, only 15 -20 min of nice walk. Beach 150 In the scope of 1 km there is a wide choice of beaches. Shop 600 Within 1 km there are several groceries. Restaurant 250 Within 1 km there are about 10 quality restaurants. For all supplementary information you can phone us or send an e-mail.